Electronic Brochures are an easy and quick way of selling technologies, hardware, digital machines, music gear etc in just one click. They are simple to download and install. Considering their 100% compatibility and approachable features, these templates can offer content to the prospective customer. They do attract both the search engines and the target spectators. 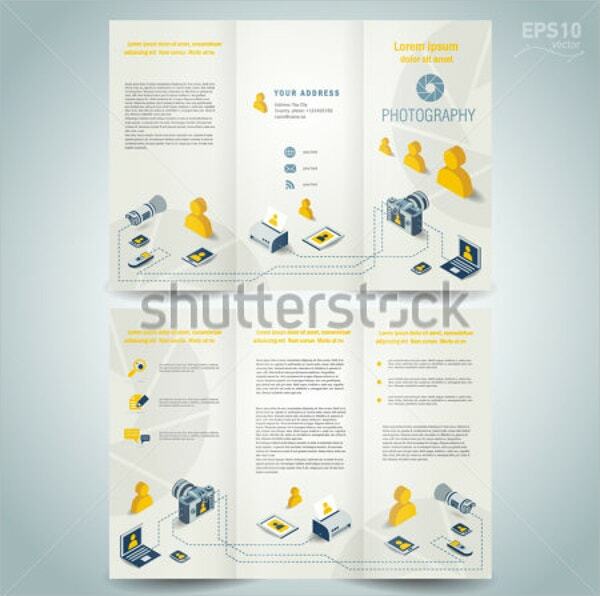 You can also see Banking Brochures Templates . 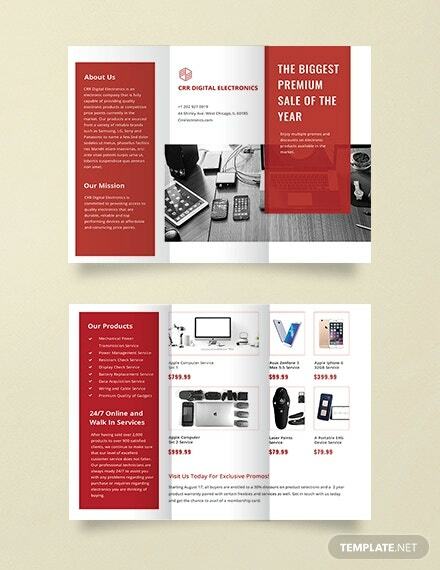 This Electronic Brochure is a Tri-Fold Sales Brochure which is created to promote products for electronics, like computers, cameras, phones, electronic devices, software, electrical applications, gadgets and much more. The 300 dpi resolution makes this electronic brochure print-ready. You can also see Square Brochures. This Fully layered and very easy to customize Electronic Sales Brochure is designed professionally for promoting business projects. It comes in PSD File format, 300 DPI resolution and CMYK color mode. You can also see Tourism Brochures. If you are looking for a first-class designed electronic brochure to express vital information about your company, then you can make use of this print-ready and well-designed Electronic Colorful Brochure. Your information will easily reach the customers as it comes with CMYK color mode. You can also see Photography Brochures. 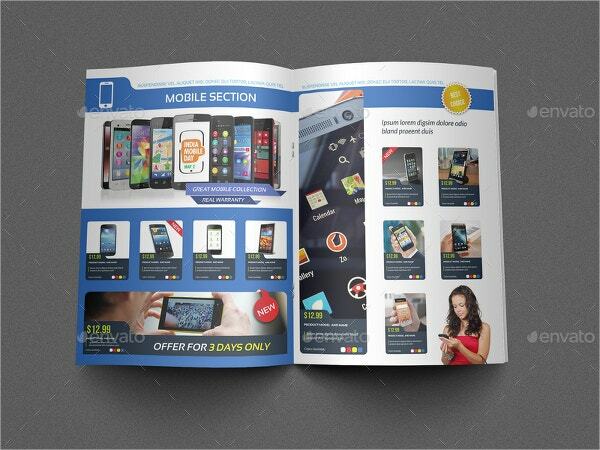 This is a classy and contemporary bi-fold brochure designed to promote your electronic shop, etc. It comes with excellent features, such as CMYK color mode, 300 dpi resolution and is fully customized. 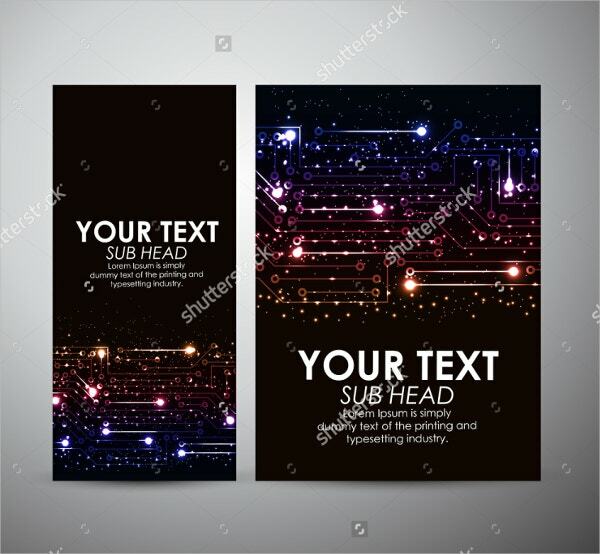 This electronic company brochure is available in various colors and sizes to meet the customer requirements and is of a high-quality resolution. It uses free fonts and comes in 11 x 8.5-inch size. 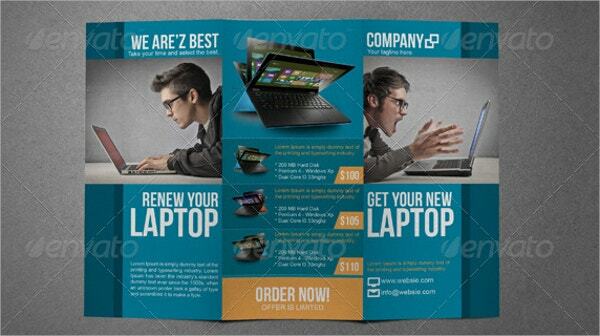 Tri-Fold Corporate Flat Design Brochure can be used as an effective tool for communicating the value proposition of your business. 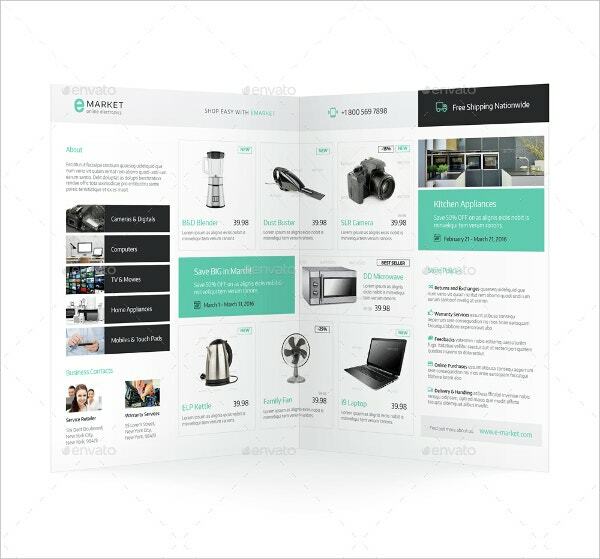 This is a very attractive and well-designed brochure kind template that shows every tiniest detail of the company in a sophisticated and stylish manner. CMYK color options and Indesign graphic files are incorporated in the module. With a 300 dpi print resolution and in CMYK color mode, Electronic Store Trifold Brochure is a stunningly designed brochure that is print ready. 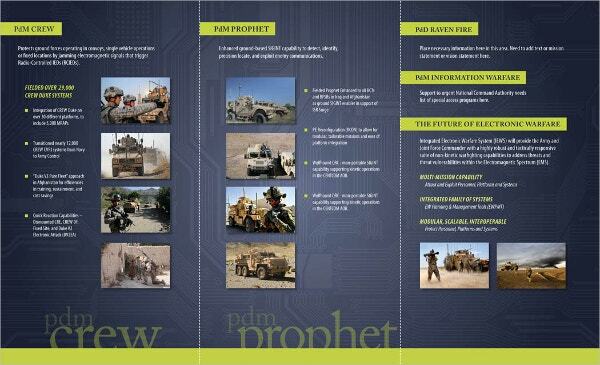 This beautifully designed electronic warfare brochure is created to be used at company events and program meetings. 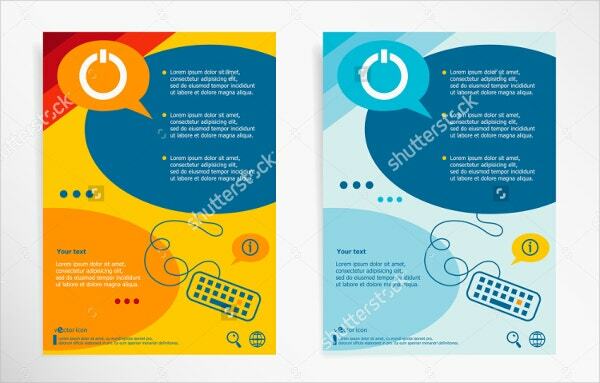 It is supported by the PSD file format and comes with CMYK color mode. 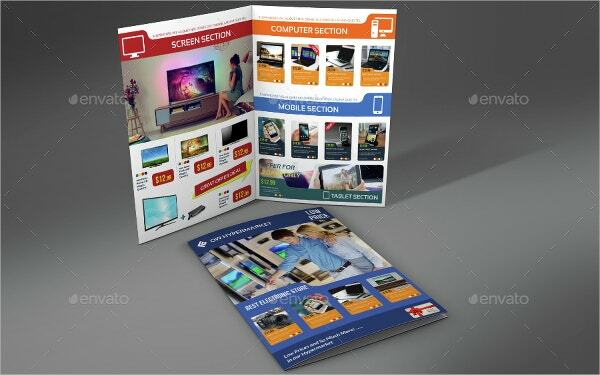 This brochure is also known as Catalog Brochure tri-fold Bundle brochure. The print dimensions of this brochure are 11 x 8.5 inches. It comes with 300 dpi resolution and fully editable text and color. 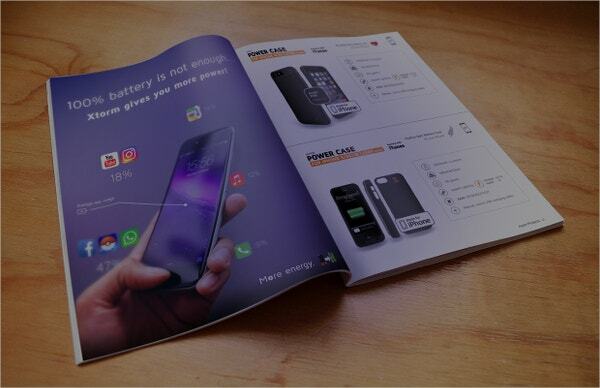 This eye-catching electronic power bank brochure template can be used for businesses like electronics or electrical appliances. 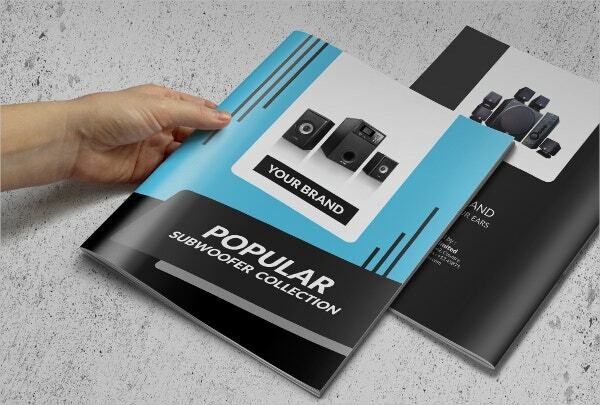 This is a high-quality resolution brochure which is obtainable in various sizes to fit the needs of the customers. 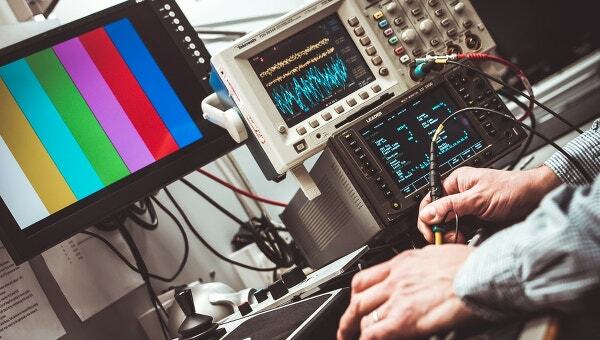 Use this amazingly designed brochure to promote your electronics products. It has Photoshop PSD graphic file comprised and is in the straightforward Adobe CS version. It has very good designs, fonts and colorful backgrounds. 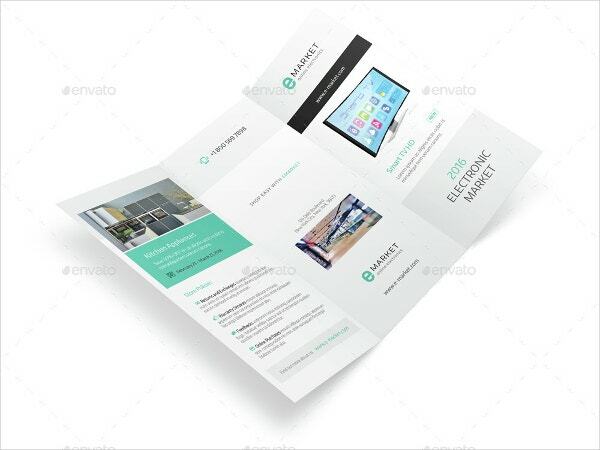 If you wish to endorse your business or corporation in an instantaneous manner, then make use of these free electronic brochure templates. They will give you the option to edit the text, fonts, color and sizes as per your needs. 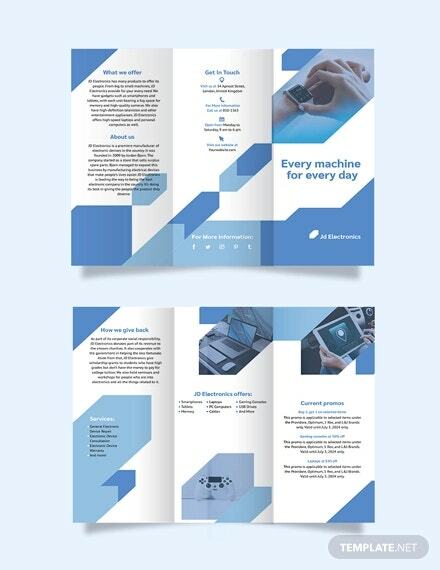 With these customized brochure templates, you can discover the best electronic brochures from the list mentioned above.